Thank you for your great service with Simona. She went over and above our expectations and worked with us to make this day truly memorable in seeing highlights of Tuscany. We started with key highlights of Pisa and the Tuscan countryside, then off to Florence for a city tour including the Uffici Gallerie, then to wine tasting Dianella Winery. Everything was superbly done and our wine tasting was even done by the vineyard owner. What a smashingly good day. Please feel free to publish this in your Trip Advisor or website. This thank you is long over due and our European vacation would not be complete if I didn't get this off to you. First of all my thanks to you for your endless patience in answering all of my many questions. Many of which may have seemed frivolous to you but you never conveyed that in your response. You made a first time traveler to Italy feel comfortable in knowing they would be well taken care of and that there was nothing to worry about. The drivers; Rafael, Federico and Carlo were professional, courteous and very knowledgeable. After we discussed with them what we wanted to do and see, they gave us ideas and suggestions of what was best given the time we had and made sure, even while driving, it wasn't time wasted. They explained the country side and some history behind the areas we were passing through and what to expect when we arrived at our many destinations. They assisted with the purchase, when necessary, of entry tickets. They were excellent! When we got back to our ship and shared our experience with others they were amazed at how much more we saw and did in the same amount off time off the ship as they did and for less money. 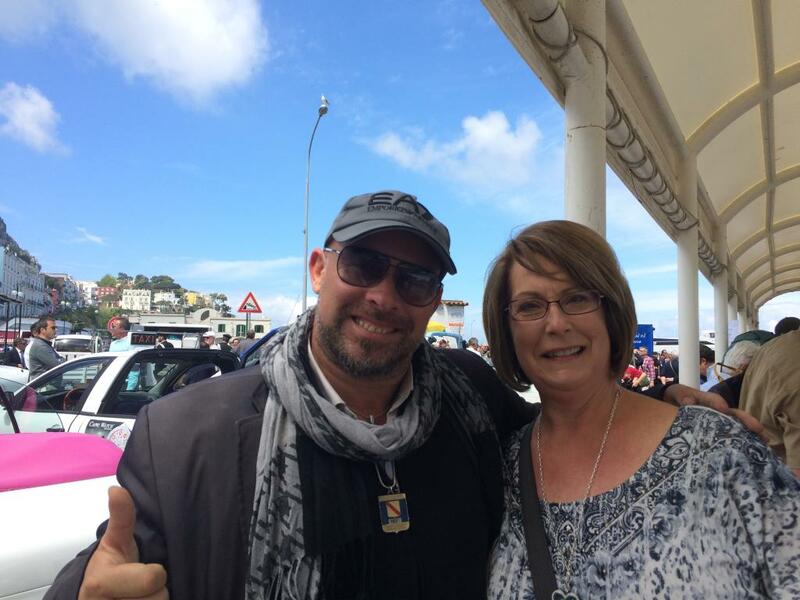 Shore Excursions in Italy is a "6 Star" company that my wife and I will use again, have recommended to many of our traveling friends and will be posting our high reviews about on TripAdvisor and other travel sites we frequent. Thank you again for making our vacation a truly memorable experience. 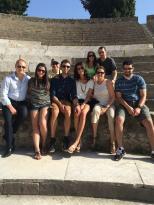 My husband and I just returned from a cruise of the Western Mediterranean with our family of 8. ( 2 parents 6 young adults , all mid twenties). The shore excursions supplied by our cruise line were very expensive so I started researching tours on Tripadvisor . We were looking for tours in Florence and Naples that our twenty-something year old children would find interesting as well as my husband and I ( mid fifties). Fortunately, we found SHORE EXCURSIONS IN ITALY. As you have probably read in previous posts the time we spent on both tours MADE OUR WHOLE TRIP!!! Our driver, Carlo, was very professional, interesting, informative , friendly, courteous, and great to be around. He spoke great English, and spoke to us on a headset while we drove from place to place. He told us all about the areas we were driving through with interesting facts about the towns and culture. Our vehicle was very clean, air-conditioned and comfortable. We were able to drive right up to any sight we wanted to see with very minimal walking! That meant more sightseeing for us and less time walking . We were picked up promptly at the pre set time and dropped off back at the ship at the appointed time. We choose to be on tour all day. But, you can tailor the tour to your needs. We started our tour in Pisa, stopping for one of many photo opportunities on our trip. We stopped for a short time and walked around Florence to see the sights and have lunch. Carlo was never far away and was always where he said he would be ready to move on to the next part of our trip. We discussed with Monica, the contact person in their office , our desire to see The David in the Academia in Florence. She said they would handle the reservation. Carlo got us right in and we strolled past the hundreds of tourists who were waiting in line! 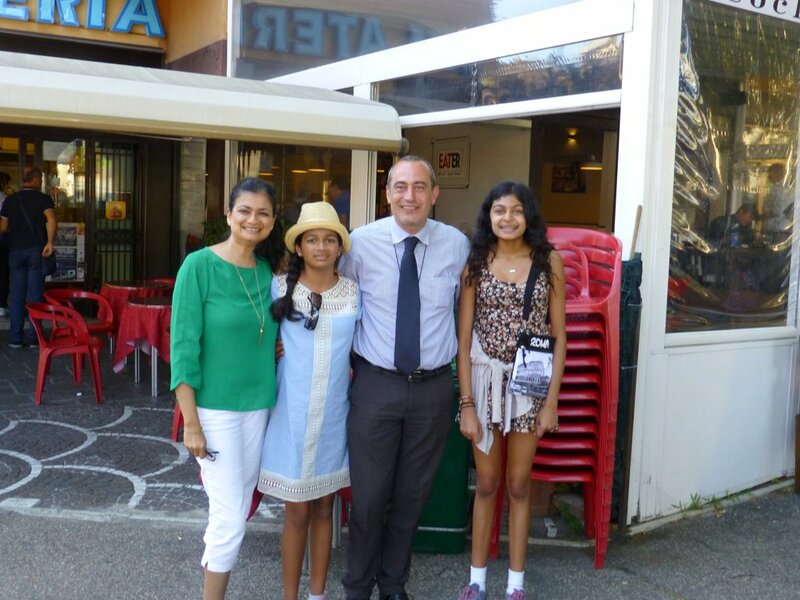 Our children wanted to visit a winery while in Tuscany and Carlo took us to San Michelle a Torri. Carlo arranged for us to have a tour and wine tasting. It was beautiful there. 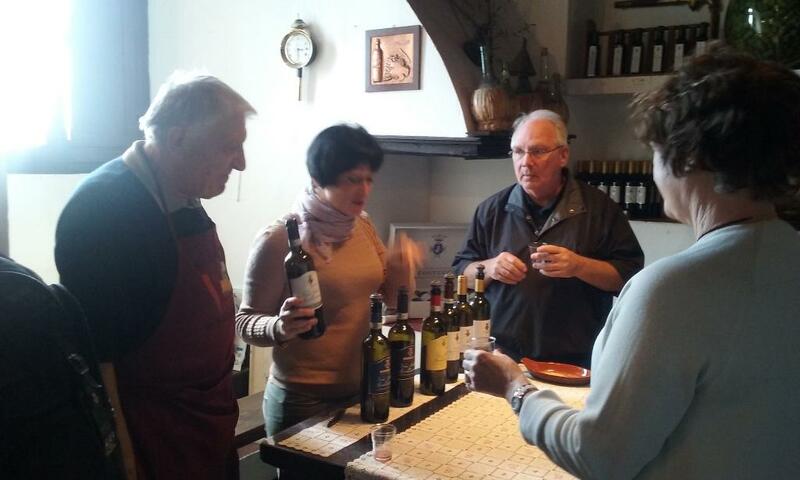 Our guide showed us around the winery ( which also made olive oil) and we enjoyed a sampling of their Chianti. By the end of our first tour it was like saying good bye to an old friend. The kids were all hugging Carlo and snapping pictures of him! 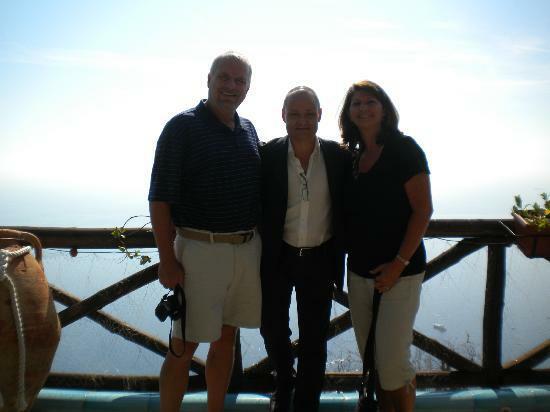 I immediately emailed Monica, and requested Carlo for our previously booked tour of Naples! Fortunately, Carlo was available! We were all so happy to see him! We had planned to visit Pompeii without a tour guide. Carlo advised against this and arranged for us to have a guide waiting for us when we arrived. One phone call from Carlo and we were all set. The tour was so much more interesting with the guide. So happy Carlo suggested it. It made a huge difference. We asked Carlo to join us on the tour and he came along with us. Carlo was an excellent driver and slowly and carefully drove us along the Amalfi Coast . We stopped at a restaurant called Da Costantino. Carlo had called ahead and made a reservation for us. It was probably the best lunch WE EVER HAD! We sat by a window with the most incredible view of Positano. It was amazing!!! I have never posted a review on anything . But, as soon as we returned from this trip I immediately emailed Monica to thank her and then wrote this review . 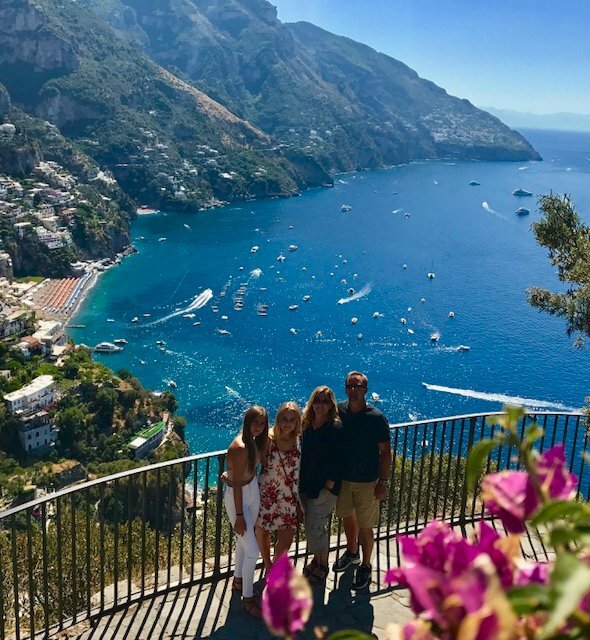 Our kids are still talking about how amazing our vacation was and we owe a great deal of it to Carlo and Shore Excursions in Italy. As others have posted, I only wish I could have had Carlo as our guide in France and Spain! I HIGHLY recommend Shore Excursions in Italy! We had a marvelous experience with shore excursions. Our guide was very friendly and entertaining. He gave us several facts along the tour which shows he has very good cultural background. We left for our cruise having booked two tours with "Shore Excursions in Italy" ahead of time. We enjoyed them so much, that we booked a third. In all, we toured Pisa/Florence (with Ricky), Rome (with Luka (spelling?)) and Pompeii (with Carlo). All three drivers were professional yet fun and extremely helpful in helping us plan a day that best fit our needs. The vans were clean and well-kept and a booster was provided for our youngest child. Not knowing much Italian, we appreciated that all the drivers were proficient in English. We had a fantastic time. Our family would tour with them again in a heartbeat! Our trip was in July of 2013 with a family of five. Kids were age 18, 16 and 6. We are a group of 17 people, and we book all three tours(La Spezia, Civitavecchia, Naples) with Shore Excursions in Italy. They were all good and exactly as the company had said. The Mercedes Minibus were comfortable for us, and the ride were safe and back to the ship on time. The tour guide came with the minibus option were knowledgeable and fun. We have save money with this option because we don't have to hire an English speaking guide at the Vatican Museum(150 Euro) and at Pompeii (120 Euro). I just thought I would let you know that we are back in the United States; and had a good trip. The services provided by Shore Excursions In Italy were exactly as we discussed and agreed to. We did pack a lot into one day, but that is exactly what we wanted. Thank you for your flexibility in designing the perfect itinerary to suit our needs. Our lunch in the Tuscan countryside at Tenuta Croce di Bibbiano was wonderful. It might have been the high point of our trip. Valeria did a great job. It was my wife’s birthday; and she couldn’t have been more thrilled. We enjoyed Ricardo; who did a great job for us. He was on time, courteous, and friendly. His English is excellent, which made it easy. Thanks again for helping make our visit a success. Reviewed by Myron C.on August 6th, 2012. Our driver was Carlo and we couldn't have been more pleased. To accomodate us we were met early at 0730 becauwe we had tickets to go up into the Leaning Tower of Pisa at 0830. We also had tickets for the Academia in Florence to see the David statue. Carlo always found a nearby parking place, knew where the cleanest restrooms were and how to get tojust what we wanted to see. He recommended a plesant place for lunch in Florence and had us back to the ship on time. Should we have reason to book again we will be asking for Carlo. We used Shore Excursions in Italy for this tour and would highly recommend them. They were waiting for us in port and our driver was very knowledgable. It was a great experience. So beautiful We loved Sorrento and Positano. Carlo brought us to Bagni Delfino for lunch. Right on the water overlooking Naples Bay. Nice people, great food, what a view. unforgettable. The drive along the coast is so fabulous. Carlo from Shoreexcursionsinitaly.net stopped where we could so we could take photos. It was another great tour. 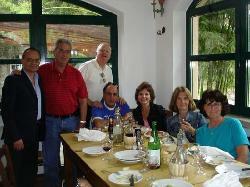 We booked an independently through Shoreexcursionsinitaly.net and were very happy with them. We wanted to pamper our mom and thought we would see more with a private van tour. They were great. We loved Florence and the David. The David is a must see for us and it was worth the stop. Carlo was able to have us walk right in - no waiting in line. They reserved our tickets in advance and we paid for them. Then after shopping we stopped for lunch at Casa Emma and had a 4 course meal with a different wine at each serving. It was simply fabulous and a great view of the Tuscany region from our outdoor table. Next San Gimignano - a walled medeval city. Lots of shops and history in a fabulous location. We all enjoyed it. If you take the tour and would rather have extra time at San Gimignano skip lunch and grab a gelato there. The ride back was filled with beautiful scenery. All a great day. Hello Shore Excursions in Italy! Happy holidays to you all, and thanks for being so incredible! If we ever come back (WE WILL) we will be seeing you for sure!